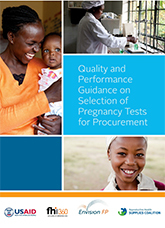 May 2017 — FHI 360 developed this document to address gaps in knowledge among governmental procurement agents involved in selecting pregnancy kits for point-of-care health systems. The guidance is also relevant to manufacturers seeking to supply pregnancy tests to global, national or local public health programs. The U.S. Agency for International Development funded the activity through the Envision FP project. Quality standards and performance specifications in the document derive primarily from the International Organization for Standardization standards, European Union and U.S. Food and Drug Administration requirements for marketing clearance, and normative documents from the World Health Organization and the Global Harmonization Task Force of the Medical Devices of the International Medical Device Regulators Forum. Authors developed the document in consultation with a committee of experts from the Reproductive Health Supplies Commission’s Market Development Approaches working group.